The 2012 crop season in North Dakota began early, providing the opportunity to plant crops in a timely manner and plant some crops, including dry edible bean (Phaseolus vulgaris L.), earlier than normal.This prompted North Dakota State University researchers to conduct field trials to explore if dry bean seed yield and quality can be increased with early planting, compared with the normal planting period (the last 10 days of May through the first10 days of June) or a late period. If so, early planting would provide the opportunity to increase profitability without additional input costs. This publication will summarize results of NDSU dry bean planting date trials conducted during 2012 through 2015. Six planting date trials were conducted by NDSU during 2012-15 at the Carrington Research Extension Center (CREC) and in 2012 at Prosper with pinto (‘Lariat’), black (‘Eclipse’) and navy (‘Avalanche’) market classes of dry bean. Table 1 lists trial locations, market types, planting dates by year and seed yield. During the early planting seasons in 2012 (including two trials at the CREC) and 2015, the first planting dates were May 11 to 17, while with later starts to the planting season in 2013 and 2014, the early planting dates were May 23 to 24. The second, or normal, planting dates for the trials ranged from May 22 to June 5, and the third, or late, planting dates ranged from June 5 to June 18. Best management practices were used for dry bean production during the trials. Among years, yield with early planting tended to be greater than with normal planting dates in five of six trials (Table 1). 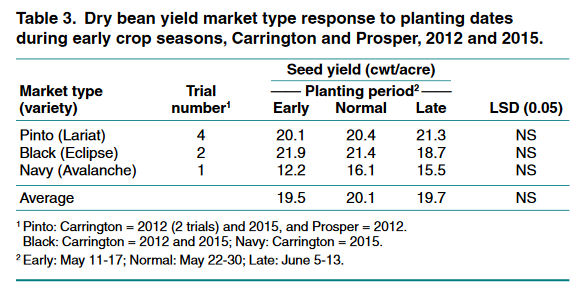 However, yield generally was statistically similar with early and normal planting dates. Yield with the early planting date was reduced in 2015 due to low plant density (44,160 plants per acre average across market types), compared with plant density (62,970 to 72,930 plants per acre) with later planting. The reduced plant stand resulted from cold and wet soil conditions (including snow) following planting, plus soil crusting that increased stress during seed germination and seedling emergence. Averaged across the six trials, yield was statistically similar among planting periods but tended to be highest with early planting. Averaged across trials for each market type, yield was statistically similar for each market type with early, normal and late planting (Table 2). When averaged among trials and market types, yield also was similar among planting periods. The crop seasons of 2012 and 2015 were “early” (cool-season crop planting generally beginning in April) while 2013 and 2014 seasons were “late” (crop planting beginning in May). Table 3 summarizes dry bean seed yield during the early growing seasons. 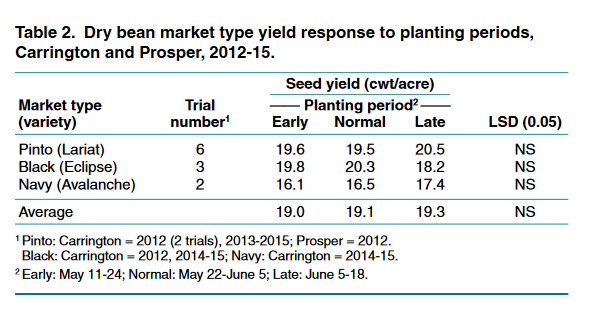 Averaged across trials, yield was statistically similar for each market type with early, normal and late planting. When averaged among trials and market types, yield was statistically similar but tended to be highest with the normal planting period. Table 4 displays plant density and development, and yield by planting periods averaged across market types for three Carrington trials. Plant density tended to be greater with normal planting, compared with other planting periods. Days from planting to plant emergence were delayed with early planting, generally due to cooler soil temperatures, compared with normal and late planting periods. Days from plant emergence to maturity averaged three days less with the normal planting period, compared with early or late planting. In 2014, plant lodging was slightly less with the normal planting period, compared with early or late planting (data not shown). Yield tended to increase with later planting. Seed quality data with planting dates averaged across market types are displayed from trials conducted at Carrington in 2014 and 2015 (Table 5). Test weight increased with normal and late planting dates in 2014 and tended to increase in 2015, compared with the early planting dates. Seed size was largest with early planting in the 2015 trial. Seed quality based on visual evaluation was variable among plant dates. The dry bean research consisted of six site-years of data with three market types planted during early, normal and late planting dates. The data collected indicate the planting period of late May through early June, normally used by farmers, remains appropriate. • Seed yield: The early planting period shows potential for increasing yield but with increased risks. However, yield with early planting was statistically similar to the normal planting period, including during “early” planting seasons. 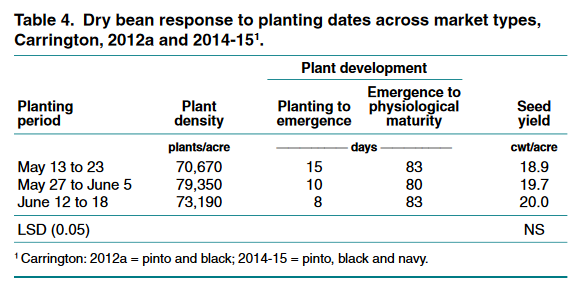 Also, these data indicate if planting is delayed until mid-June, yield will be maintained. • Seed quality: Test weight tended to increase with normal vs. early planting periods, with generally no consistent impact on seed size or appearance. Research was supported by the Northarvest Bean Growers Association and North Dakota State Board of Agricultural Research and Education.